Watchminder 2 – Like A Personal Assistant Strapped To Your Wrist | OhGizmo! There are plenty of devices on the market for those of us born with a particularly poor memory. The Watchminder 2 (I guess I missed version 1) conveniently puts everything you should be remembering on your wrist. The watch has 30 daily alarms that are completely customizable and can even include messages as to what the reminder is about like “take your medication” or “wake up and go to work.” You know, the usual stuff we all tend to forget. The Watchminder 2 also has a standard beeping alert but if you prefer to be more subtle about your reminders you’ll probably want to stick with the vibrating alarm instead. Now besides the ‘reminder mode’ the watch also has a ‘training mode’ which is supposed to be used for breaking bad habits like smoking, nail biting or forgetting to wake up and go to work. Unfortunately though I really have no idea how this ‘training mode’ works since the website is pretty vague about it. 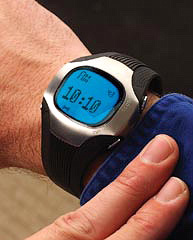 The Watchminder 2 is currently available from firstSTREET for $99.95 and could be an invaluable tool as long as you remember to put it on each morning. This would be a great tool for those that have suffered brain injuries.